Heat oven to 350°F. Stir cookie mix, oil, water and egg in medium bowl with spoon until dough forms. Press in ungreased square pan, 8x8x2 inches. Bake 20 to 25 minutes or just until set. Cool completely, about 30 minutes. Stir together frosting and marshmallows; spread over bars. Sprinkle with peanuts. For 16 bars, cut into 4 rows by 4 rows. Store tightly covered. To easily remove and cut bars, line pan with aluminum foil, leaving about 2 inches of foil hanging over edges of pan. Press dough into pan. After baking and cooling, lift by edges of foil to remove and cut. Got milk? 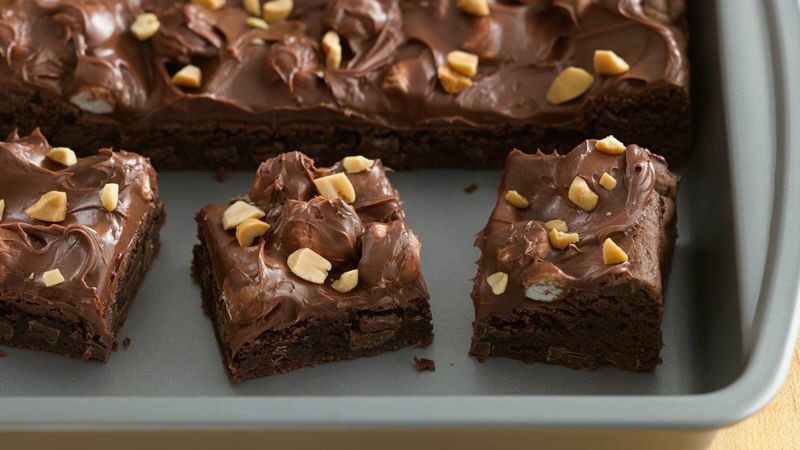 Power-Packed Rocky Road Bars are the perfect accompaniment.